At Cudo we understand the tuning required to maximise your mining rigs performance and profitability. That’s why our desktop miner’s Advanced Settings menu provides you with tools required to add preset optimisations to each of the cryptocurrency hashing algorithms that we support, based on your installed GPUs. There are many variables that miners need to keep on top of; Market value of the coin being mined, hardware optimisation, supported driver updates, mining software versions and as if that wasn’t enough, each algorithm has its own optimal set of configurations. 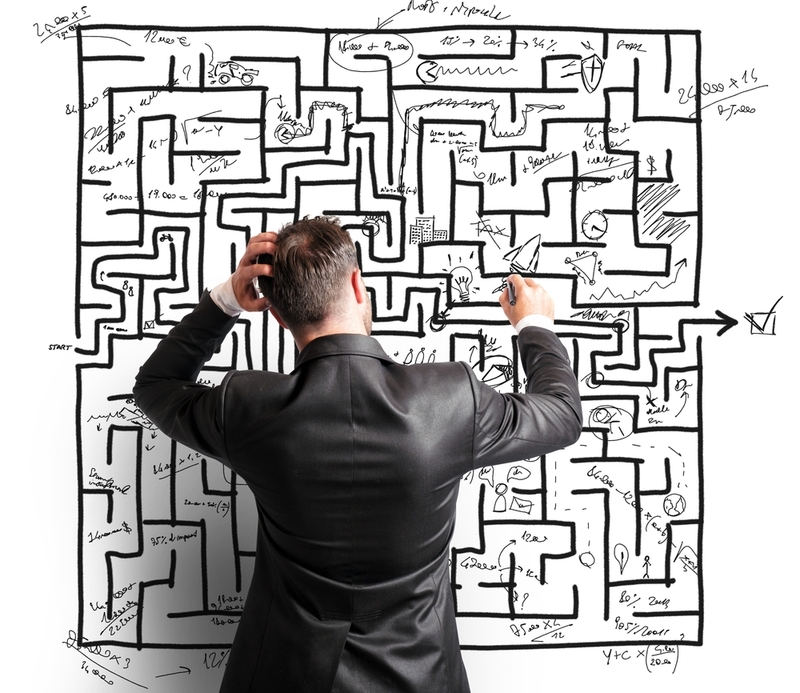 The learning alone is time-consuming and then there’s the execution and ongoing management, for when just one of these variables changes (which they often do). For the tech-savvy experienced miner with free time on their hands, all of this can be enjoyable and rewarding but there is a fast growing market of non-technical or crypto inexperienced people who would like to start mining cryptocurrencies. As passionate supporters of crypto, we feel it is important to make mining as accessible as possible to everyone. At it’s very simplest, our desktop miner can be installed by anyone with a computer and all that user has to do is press start, with the software automating the rest. Perfect for users with laptops and desktops but rig mining is different, it’s complex and generally command line driven and so we have collaborated closely with the rig mining community to bridge the gap between command line and GUI miners in the settings that we provide. 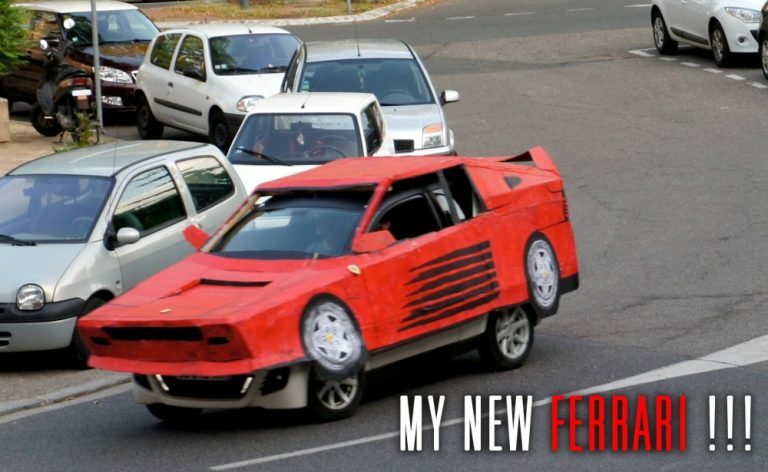 In this early release, the advanced setting defaults are currently factory set and unoptimised for mining. Overtime, the Cudo Miner software will create optimal advanced setting defaults per GPU model, through machine learning. Below we look at the Advanced Settings range availble now for both NVIDIA and AMD GPU’S and explain what they are. Each of the supported algorithms available based on your hardware will show here with details of the mining software displayed. From the below screenshot you can see that Ethash is using Ethminer as the underlying mining software. This is important as the underlying mining software will usually suggest the optimal settings on their websites, plus there are also plenty of online forums and reviews providing specifications other miners have trialled before, saving you time. The following settings are universal per each algorithm and can be tweaked independently. Please note that all settings described below will have an effect on all of your GPUs per machine or rig. The Benchmark Length and Benchmark Timeout fields will recommend a default time parameter as they are not linked to your hardwares performance. These settings allow you to set how long the algorithm benchmarking takes along with how long before you would like the Miner to timeout trying to benchmark should a hashrate value not be returned by that point. Similar to the GPU throttle on the main Miner page, this feature allows you to scale the time between kernel executions. The higher the number, the lower the mining performance. Users with a single GPU that is also used for other tasks may want to add a value of 500+ to prevent computer performance issues. CUDA Scheduling refers to the core architecture of NVIDIA GPUs and how they communicate with the CPU. 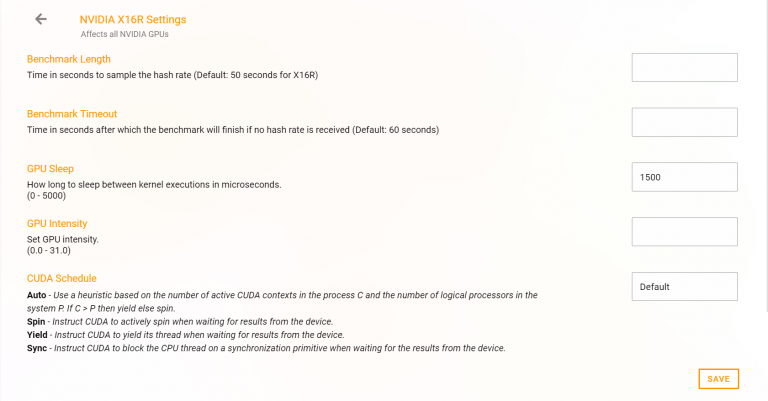 cudaDeviceScheduleAuto: The default value if the flags parameter is zero, uses a heuristic based on the number of active CUDA contexts in the process C and the number of logical processors in the system P. If C > P, then CUDA will yield to other OS threads when waiting for the device, otherwise CUDA will not yield while waiting for results and actively spin on the processor. 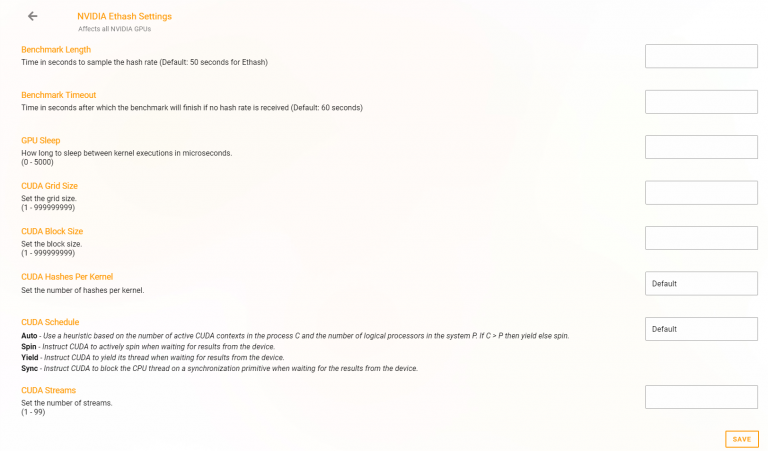 cudaDeviceScheduleSpin: Instruct CUDA to actively spin when waiting for results from the device. This can decrease latency when waiting for the device, but may lower the performance of CPU threads if they are performing work in parallel with the CUDA thread. cudaDeviceScheduleBlockingSync: Instruct CUDA to block the CPU thread on a synchronization primitive when waiting for the device to finish work. GPU intensity refers to the size of work being submitted to the GPU at any one time. By increasing the number, you are also increasing the work being submitted to the GPU. Finding an optimal value, rather than setting to the maximum value is key here to prevent performance and error issues. For the execution of compute kernels, NVIDIA created a parallel computing platform and API called CUDA.Setting grid size and block size determines the total number of threads; where total threads = grid size x block size. Block size is generally limited to 1024. Grid size is not limited but very large sizes may cause your display to freeze if you have a monitor plugged in. 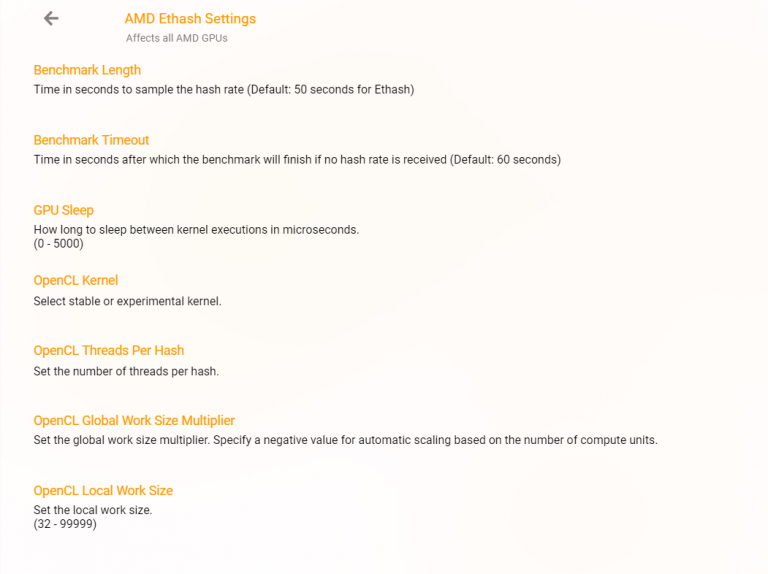 To increase the hashrate when mining Ethash based coins, set the number of hashes per kernel to the recommended optimal settings for your hardware. Optimisation can produce >5% hashrate increase. Sequences of asynchronous commands are executed concurrently between all processors available including any CPU and GPU. Without specifying a stream, the Miner will run the NVIDIA default stream. A thread contains assigned execution resources which are organised into streaming multiprocessors. The number of threads that can run in parallel is equal to the number of streaming multiprocessors multiplied by the maximum number of threads each of these can support. Whereas with the Ethash algo you are custom setting the block size, with CryptoNight V2 & CryptoNight Lite you are determining the number of blocks. Threads are organised into blocks and then executed by a multiprocessing unit. 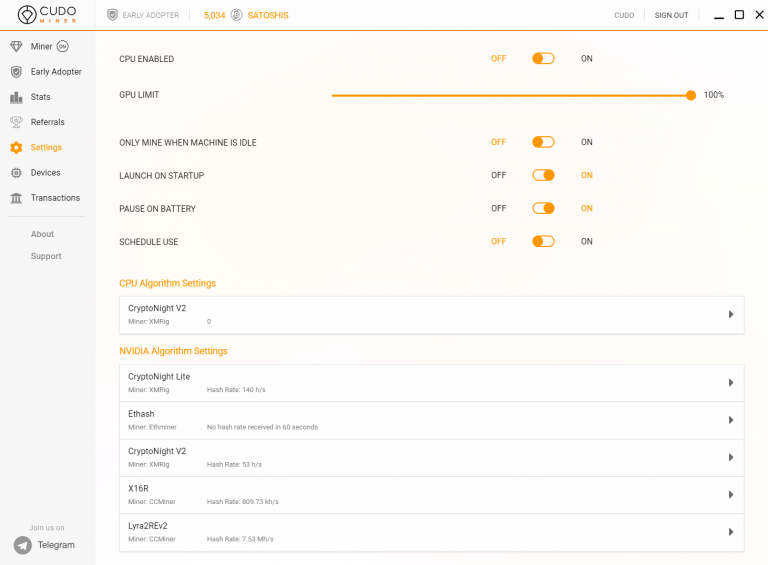 The CUDA BFactor setting allows you to run the core kernel in smaller pieces for CryptoNight V2 & CryptoNight Lite. Whereas a 1080 Ti runs better with a BFactor setting of 6, each NVIDIA GPU model will have it’s own optimal setting which can be found on the underlying mining software website or on mining forums. 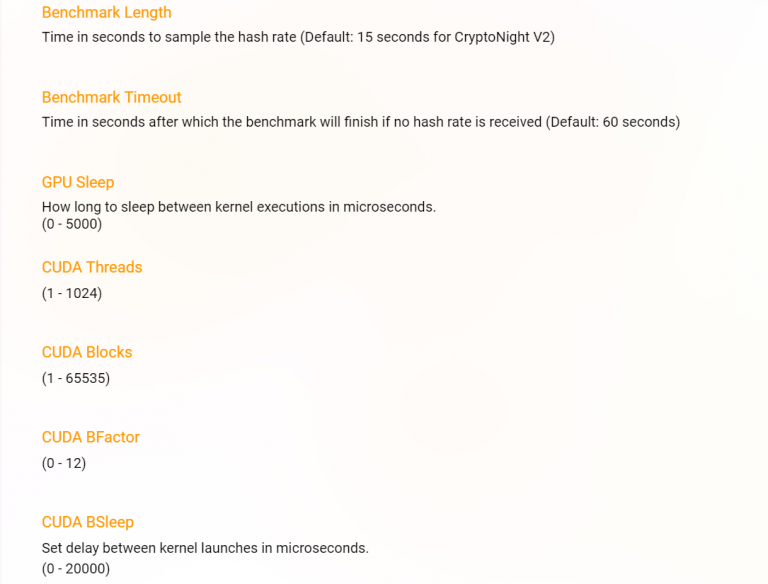 Slightly different to the GPU Sleep setting in other algo’s, the CUDA BSleep feature allows you to scale the time between kernel launches, rather than executions. The higher the number, the lower the mining performance. Users with a single GPU that is also used for other tasks may want to add a value of 500+ to prevent computer performance issues. This is useful on windows to prevent instability. If Windows displays a message saying ‘Application has been blocked from accessing graphics hardware’, ‘Display driver stopped responding’ or blue screens; this is because of and ‘Timeout Detection and Recovery’. Increasing this number will prevent problems. Once you have completed for each of the algorithms available based on your hardware, head back to the main Miner page and select the GPU coin you wish to mine. Now you have customised each of the algos, you can even run in Auto mode knowing that as our Miner switches coin due to profitability, your presets will already be installed to ensure you’re mining is fully optimised from the software side. The above setting recommendations are based on MSI Afterburner overclocking. For users preferring Precision X, double the memory. For example, a +100 memory setting with MSI Afterburner is a +200 memory setting with Precision X (guide only). The Benchmark Length and Benchmark Timeout fields will recommend a default time parameter as they are not linked to your hardware performance. These settings allow you to set how long the algorithm benchmarking takes along with how long before you would like the Miner to timeout trying to benchmark should a hashrate value not be returned by that point. Whereas NVIDIA uses its own CUDA parallel computing platform, AMD usesOpenCL.OpenCL provides a standard interface for parallel computing using task- and data-based parallelism. This advanced setting therefore enables the user to choose between leaving as default, or changing to either stable or experimental. The parallel hash option only works if the setting is changed to experimental as it controls how work is divided up whilst using the experimental kernel. 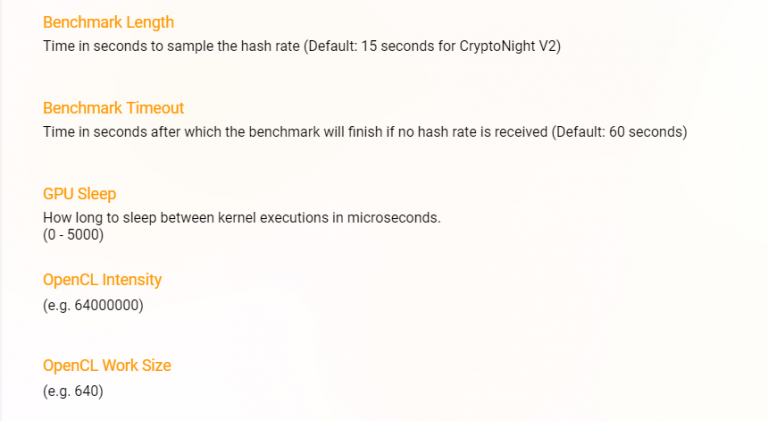 With a hash value representing a string of characters and a thread containing assigned execution resources which are organised into streaming multiprocessors, the threads per hash field allows you to preset the amount of parallel kernel executions made per hash. The total number of work items for the kernel to execute is equal to the Local Work Size multiplied by the Global Work Size Multiplier. OpenCL Intensity refers to the size of work being submitted to the GPU at any one time. By increasing the number, you are also increasing the work being submitted to the GPU. Finding an optimal value, rather than setting to the maximum value is key here to prevent performance and error issues. Work Size is determined by the grouping of jobs (Work Groups). Therefore, choosing the size of each Work Group and the number of Work Groups being sent concurrently, will form the optimal Work Size to set. How Can I Use My Cryptocurrency? The Rise (and rise) of Monetising Idle Compute – Is It Worth My While?